I am presenting this case for your opinion. 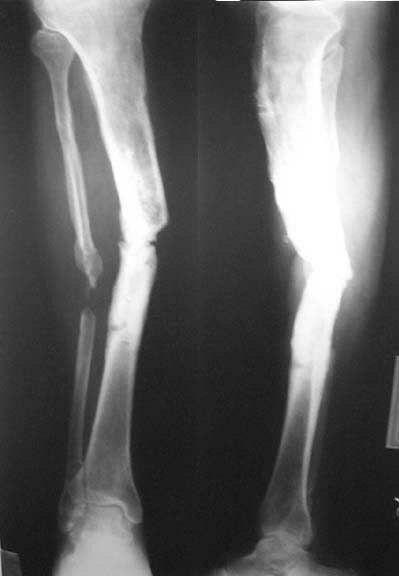 48 year old diabetic patient presented with 6 month old infected compound fracture right tibia with discharge of pus about two and a half years ago. He was treated earlier with external fixation, rotation flap and later with POP cast. After he presented toour unithe underwent debridement, Ilizarov ring fixation , compression at fracture site followed by distraction of upper metaphyseal corticotomy. Union was achieved in about one and a half years following which the rings were removed. He was initially given a PTB walking cast and followed by a PTB brace. He was ambulant with this. Six months after the ring removal he fell down and refractured the original site. This was treated with POP long leg cast followed by a PTB walking cast. Now six months after the refracture, the tibia is ununited. There is no skin breakdown. Patient's present x-ray is attached. Our plan: Open debridement of fracture site with excision non union. Interlocking nailing using solid nail. 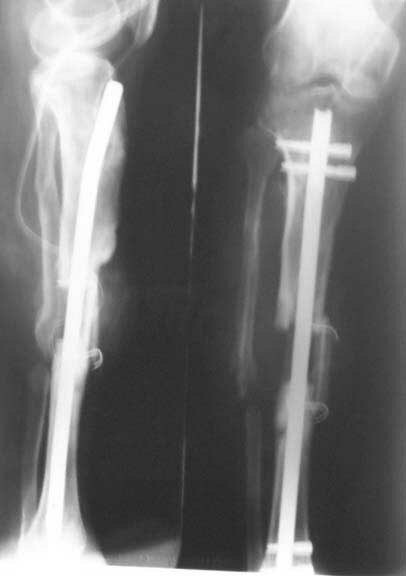 Augumentation of fracture with microvascular transfer of fibula from the other leg. Would welcome comments and opinions. Does bone end exposure/skeletization increase vascularity? DTIG> since there was no attempt at callus formation after the refracture(Going towards atrophic non union.) So what result in the case can be expected after reamed closed nailing? I think I have some answer for your querries. No exposure will not increase vascularity. But I had proposed excision non-union site and vascularised fibular transfer to this site from the opposite fibula using microvascular technique. This should definitely increase local vascularity and enhance chances of union. So what result in the case can be expected after reamed closed nailing? I do not think closed nailing would have been possible in this case. In fact I can say it positively now since we took this case for surgery today. Both the ends of the nonunion site were sclerosed. Inthe proximal end of canal was easily opened by resecting a little bone. But on the distal side bone had to be resected for about 3cm before any semblance of canal could be seen. This had to be initially drilled with a small drill bit and then gradually enlarged. So an attempt at closed nailing could not have succeded at all. What we did today: Open resection of nonunion followed by open interlocking nail using solid nail. The gap was interposed with vascularised fibula from the opposite leg using microvascular anastomosis. In fact my colleague who did the microvascular surgery had to struggle since the vessels in this diabetic patients was atherosclerotic. I have just returned after this long surgery and as it stands the stability is good and the flap vascularity is good. Pray and hope that this will be the last surgical interference this patient will require. I will try to attach the post op x-ray picture. Sounds reasonable. Let's hope the anastomosis will remain functional as long as needed. DTIG> resected for about 3cm before any semblance of canal could be seen. This had to be initially drilled with a small drill bit and then gradually enlarged. So an attempt at closed nailing could not have succeded at all. Isn't there some long awl/drill specially designed for situations like this? DTIG> What we did today: Open resection of nonunion followed by open [...] interference this patient will require. Looks great, congratulations! Is the implant strong enough for early weight-bearing? Do you plan additional grafting to fill rest of the defect? Or maybe bone transport over the nail?